Brother Jesse: This year, you helped to launch the much needed Peace Keepers Initiative in New Orleans. February 2010 will make one full year since you all started going into the streets for one full hour every week. Break down to us who has been involved, what has been the impact amongst the people and how it will increase next year. 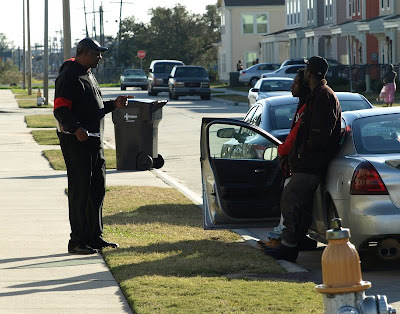 Willie Muhammad: The New Orleans branch of the Peace Keepers is made up of a diverse group of brothers. We have brothers from the mosque, church, community activists, a popular radio talk show host and just concerned Black men who want to see our community improved. Allah (God) has blessed us with success. We have helped dozens of youth to sign up for G.E.D. courses, we have helped people to begin the expungment process, pass out information about STDS, helped a couple to get marriage counseling and provided spiritual counseling for a mother whose young daughter was shot. Our work has also played a role in the decrease in violent crimes in the city. We targeted the neighborhoods labeled as â€œhot spotsâ€ by the NOPD. The very first day we began the Hour of Power we stopped a group of youth from attacking another youth in front of his mother. During another time one of the brothers persuaded some young brothers to put away an AK 47 and hand guns. They were planning to shoot someone they believed caused the death of their friend. Next year our goal is increase our numbers. We want to be able to have several groups of brothers penetrating various neighborhoods at the same time every Saturday. Brother Jesse: So many of my blog readers are always in search of the answer to the “What can I do?” question. The Peace Keepers is something very practical that can be started in any city. Please provide the blueprint as to how one could launch this same action no matter if they are in Los Angeles or London. Willie Muhammad: I would strongly encourage anyone who would like to establish the Peace Keepers in their city to contact Brother Dennis Muhammad. He actually introduced the idea to me. He can be reached on Face Book or at his website www.enotainc.com. The Peace Keepers is actually a national organization with branches in various cities throughout America. Brother Dennis is the founder of the Peace Keepers One Hour of Power Community Initiative. It is a proactive approach. Brother Dennis really took the theme to heart that the Honorable Minister Louis Farrakhan gave our 2009 Savioursâ€™ Day which was â€œAccepting the Responsibility to Build Our Communities.â€ Those instructions by the Honorable Minister Louis Farrakhan are still in effect. Brother Jesse: It seems longer, but August 2010 will make five years since Hurricane Katrina struck. I hear some people are just tired of talking about it. 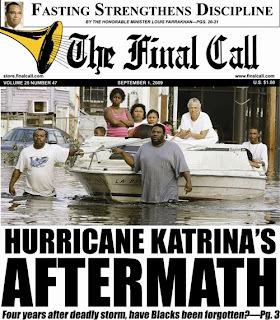 Do you think Katrina is even worth talking about or commemorating anymore? What are your thoughts about reports of the shootings by NOPD during the flooding? Willie Muhammad: I think that our talk about Katrina should be to remind our people that the need to take responsibility for our community is still relevant. However, after being reminded we need to go to work. People are tired of the commemoration activities, the participation and enthusiasm behind such events has waned every year since the first commemoration. All future commemorations should be in the form of action. There are still elders who need their homes repaired. The city is still unable to provide sufficient help to those who suffer from mental illnesses. There is still so much work that needs to be done. Regarding the police shootings during the aftermath Katrina, I believe they are true. There were a lot of horrible acts that took place during that time that the media has not covered. Remember there are still families who still do not know where their relatives are. Not only were shootings done by the NOPD but there were groups of Whites who formed hunting posses and shot Blacks who were seen in their neighborhoods. Brother Jesse: As for Muhammad Mosque No. 46, you all hosted a re-dedication ceremony of your building this year. What’s in store for the Believers in your city? Willie Muhammad: First we want to be found carrying out every instruction given by the Honorable Minister Louis Farrakhan. Therein lies our success. After that we have been having more socials for the Believers, focusing on the new Believers who are accepting and working to strengthen the marriages and families. Brother Jesse: Lastly, you have had the honor of being in the company of the Honorable Minister Louis Farrakhan away from the rostrum. What qualities have you seen him exhibit in terms of how he treats those around him? What has he done for you in terms of your personal development as a student minister? Willie Muhammad: The two of his many qualities that come to mind are the Honorable Minister Louis Farrakhanâ€™s love and his integrity. The Honorable Minister Louis Farrakhan wept while driving through the Lower 9th ward and seeing the devastation caused by Hurricane Katrina. He stopped the caravan to talk to a family who was there removing debris from their damaged home. The Minister spoke words of comfort to the couple and informed them how he would use his influence to bring attention to what happened to the citizens of New Orleans. The Minister is the most principled man I know. Once while at dinner with the Minister he asked someone present about the well-being of a prominent pastor in his city. The brother began telling the Minister about how he was approached by a member of this pastorâ€™s congregation, who disclosed latest church gossip about the pastor. Before the brother began to repeat what he was told. The Honorable Minister Louis Farrakhan interrupted and admonished him to be suspicious of anyone who comes to you with information about what is allegedly going on in another manâ€™s house. The Minister informed us that we should not feed into that kind of talk. This dinner was a very intimate setting. Many people would have listened and turned this discussion into table talk for the night. However, the Honorable Minister Louis Farrakhan did no such thing. He instead taught us by his ACTIONS and his WORDS the proper way to respond. When I think about the Ministerâ€™s character I think about what Allah (God) says of His Servant in the Holy Qurâ€™an. Surah 68:4 says, “And most certainly you (O Muhammad) are of most sublime and exalted character.” There are so many other examples that also come to mind.